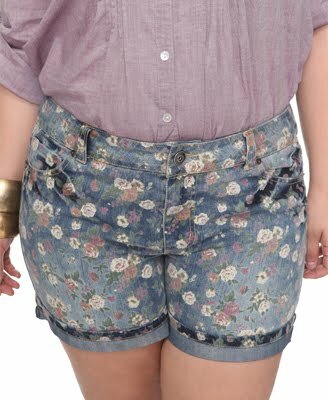 Spring is slowly approaching and I am more and more excited about Spring 2011 Fashion. Clothing Companies such as Faith 21, Asos Curve, Old Navy etc always delivers when it comes to seasonal fashion. I picked a couple of looks from Asos Curve and Faith 21 that I plan on getting. I am keeping my eyes open to different fashion statements for the season. Hi! I found out about your blog through Chictopia, and love it! I love how you blog about this, because you don't have to be a size 0 to love fashion, so thank you. Those floral shorts are awesome, and I especially love how they are folded at the end.